Earth’s protective ozone layer is on track for recovery within the next few decades according to a new assessment by 282 scientists from 36 countries. The abundance of most ozone-depleting substances in the atmosphere has dropped since the last assessment in 2010, and stratospheric ozone depletion has leveled off and is showing some signs of recovery. These observations were the headlines of the recent “Assessment for Decision-Makers,” part of a larger report to be released in early 2015 by the United Nations Environment Programme (UNEP) and the World Meteorological Organization (WMO). The stratospheric ozone layer shields us from most of the damaging ultraviolet rays from the Sun. In 1974, scientists discovered that chlorine- and bromine-containing compounds such as chlorofluorocarbons (CFCs) and halons could deplete the ozone layer, and by the mid-1980s, they had observational evidence that it was happening. In 1987, international leaders crafted a treaty to phase out the production and consumption of these ozone-depleting chemicals. The Montreal Protocol was signed on September 16, 1987, and the date is celebrated each year as the International Day for the Preservation of the Ozone Layer. 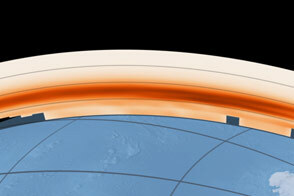 The image above shows the Antarctic ozone hole on September 13, 2014, as observed by the Ozone Monitoring Instrument (OMI) on the Aura satellite. The video below shows the South Pole on the day of minimum ozone concentration between 1979 and 2013. Stratospheric ozone is typically measured in Dobson Units (DU), the number of molecules required to create a layer of pure ozone 0.01 millimeters thick at a temperature of 0 degrees Celsius and an air pressure of 1 atmosphere (the pressure at the surface of the Earth). The average amount of ozone in Earth’s atmosphere is 300 Dobson Units, equivalent to a layer 3 millimeters (0.12 inches) thick, about the height of 2 pennies stacked together. According to the UNEP/WMO assessment, total column ozone declined about 2.5 percent over most of the world during the 1980s and early 1990s, but has remained relatively unchanged since 2000. The amount of ozone-destroying chlorine and bromine compounds in the air has dropped by 10 to 15 percent since a peak in the late 1990s. And by some accounts, ozone levels in the upper stratosphere may now be increasing slightly. However, the road to recovery will be a long one. Ozone-depleting chemicals—which were once used for refrigerants, aerosol spray cans, insulation foam, and fire suppression—persist for decades in the atmosphere. Though CFCs and similar chemicals were phased out years ago, the existing gases in the stratosphere will take many years to decay. If nations continue to follow the guidelines of the Montreal Protocol, the UNEP/WMO report notes, ozone levels over most of the globe should recover to 1980 levels by 2050. 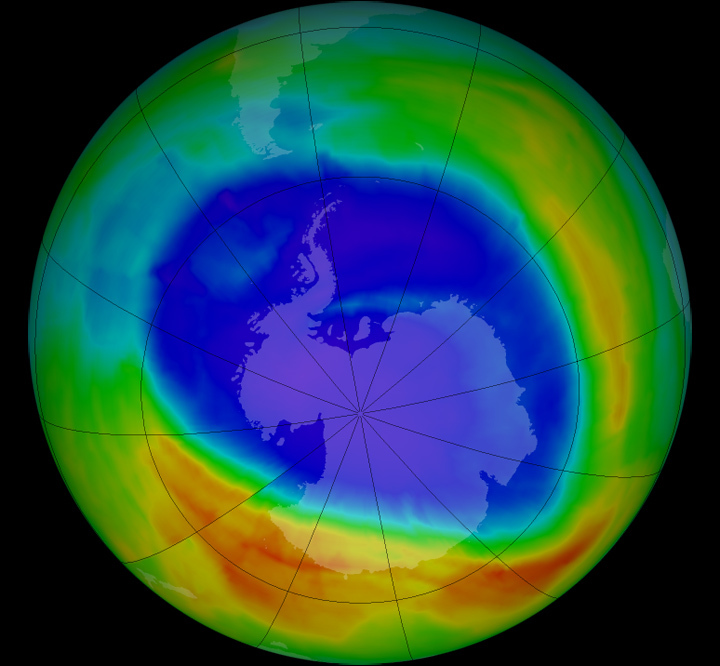 The ozone hole over the South Pole will take longer to recover, ending by 2070. Beyond the positive impact on the ozone layer, the banning of CFCs and similar compounds has had a positive effect on climate because such chemicals are also greenhouse gases. 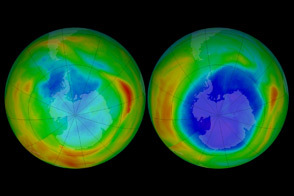 The UNEP/WMO team cautioned that one of the key replacements for CFCs—hydrofluorocarbons (HFCs)—do not harm the ozone layer but they are potent greenhouse gases that could contribute substantially to climate change in the coming decades. 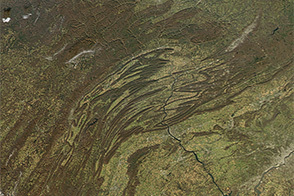 NASA image by Jesse Allen, using imagery from Ozone Hole Watch. 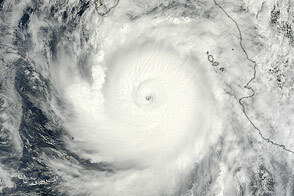 Caption by Michael Carlowicz derived from press releases by NASA, NOAA, and UNEP. The growth of the ozone hole appears to have stopped thanks to the banning of most ozone-depleting chemicals. NASA (2014, September 10) International Action Against Ozone Depleting Substances Yields Significant Gains. Accessed September 15, 2014. 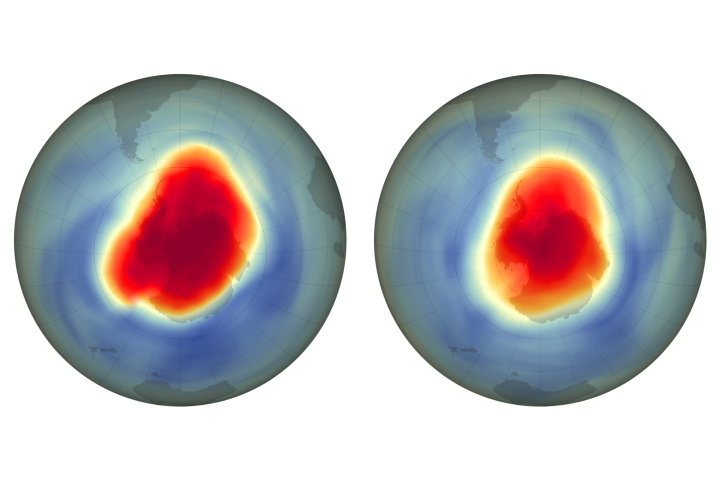 NASA Earth Observatory (2014) World of Change: Antarctic Ozone Hole. National Oceanic and Atmospheric Administration (2014, September 10) Report: telltale signs that ozone layer is recovering. Accessed September 15, 2014. United Nations Environment Programme (2014, September 10) Ozone Layer on Track to Recovery: Success Story Should Encourage Action on Climate Change. Accessed September 15, 2014.